Envision me surrounded by little Austrian children. Maybe if I added sound..... I am not tipping over in this photo, I am dancing & singing "Let's start at the very beginning, A very good place to start. When you read you begin with -- A,B,C, when you sing, you begin with do re mi. .... Do re mi? ...."
OK, get it now? See the similarities? I was standing right where Maria & the children were standing while singing in "The Sound of Music." Can you believe it?? Pinch me! See to the right? This is Residenz Square. The German troops marched through here and Maria crosses through here while singing "I have confidence in me" on her way to the Trapp Villa by bus. Residenz Square used to be a medeival bishops' residence. 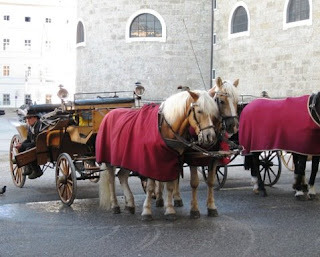 Salzburg was our final stop in Europe. We flew through it by train earlier in the week and were so happy to have time to go back & spend two nights there. 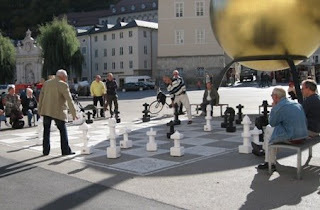 You really need two days for Salzburg. We only had one full day, but we didn't do much of the touristy things. 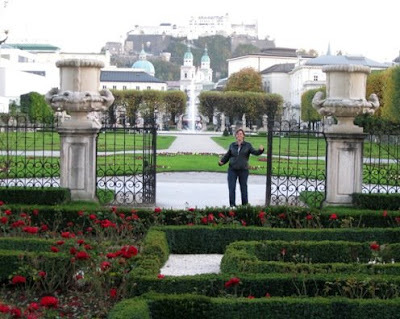 I was totally obsessed with tracing the Sound of Music and taking my photo in each spot. We did not take the 4 hour tour that went by bus to all the destinations, because I hate group tours, so we ambled along on our own and found some of the sites. We also wanted time to hike across the Monchsberg & mostly we were ready for some peace and quiet after racing through Europe for the past two weeks. The first thing we did was to rent a bike. 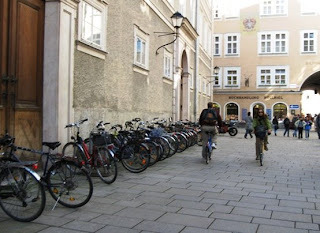 In Europe in general, tons of people ride bikes for transportation, it is so cool. 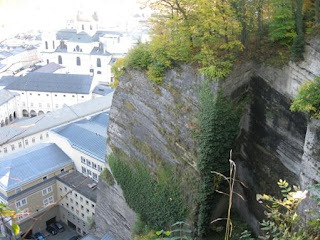 In Salzburg, it was extreme. More than half the population was on a bike. Citybike has bike rental stands here and there where you can use your credit card to rent a bike and return it at any stand. It is not terribly easy to use and you need to check your bike out good before you process your card. Both of our bikes had a few minor problems. Also, we wished we had rented bikes from a human so that we could ask them questions related to what we wanted to see and where we wanted to go. With a human, we would have gotten a city map, too. But anyway, we got our bikes and had the best time riding them around. It's the best way to get an overview of the city. We picked out places we wanted to walk back to and shop or eat. We rode to the Mirabell Gardens (see top photo). We rode all along the river and through the old buildings under the castle. After we returned the bikes, we went back and shopped a little. We found this unbelievable leather store. Gabriela Kainberger, the owner, scouts around for antiques & uses various parts from the antiques on her leather bags - an old belt buckle, for example. Everything, therefore, is original. I was so craving a certain leather bag for 800 Euros. At that time, 1 Euro = somewhere around $1.50. So, no, I wouldn't be getting this leather bag. I coveted her creativity. Soon after the handgefertigle lederwaren shop, we found a Christmas shop. Oooo la la. I was in here for probably an hour. There was an entire room for eggs. It was spectacular. 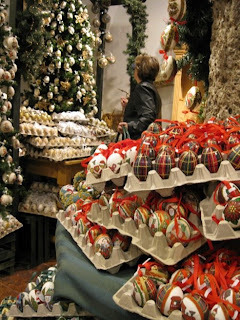 I took all that time to pick out two ornaments for my mom, which I then had to carry across Europe and over America, with the fragility of a mother hen. 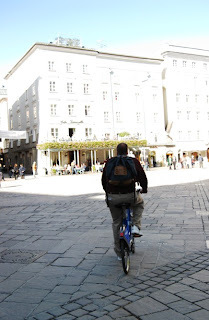 We were shopping along the Getreidegasse, a charming shopping area with tall, narrow houses, cobblestone streets and little secluded passageways. I think Mozart's birthplace was one of these houses and probably now contains a museum. We didn't do any touring, we were so ready for open air & hiking. 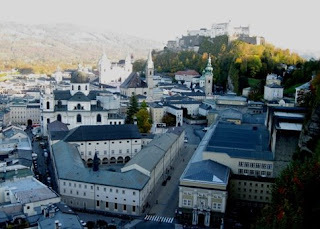 After shopping, we had mozart cake with espresso at a cute cafe & took the Monchsberg Funicular up to the Hohensalzburg Fortress (top of hill in right photo). 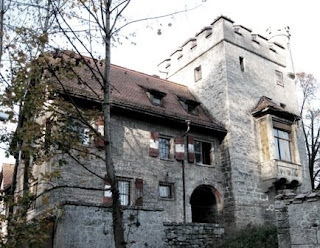 Built in 1077 by Archbishop Gebhard, the fortress is largest, fully-preserved fortress in central Europe. We explored the fortress and stopped at a cafe on the very top and relaxed. Then we began our loooooong hike across the Monchsberg. It was incredibly awesome. There were several lookout points for taking pictures of the city. There were old castle ruins here & there. & a 15th century Parish Church. It was quiet, a good bit deserted. The few people we passed looked to be locals out on their daily jog or hike. There was a lonely photographer setting up to get some twilight photos. The hike was everything we wanted it to be. At some point in history, they tried to cut completely through the Monchsberg to divide it into two pieces and have a road in the middle. They didn't cut very far before they realized this was not to be done. You can see, to the right, the cut marks, they are called incisions. I thought that such an appropriate term! When they gave up cutting through the whole thing, they built a tunnel through it, which still stands today. 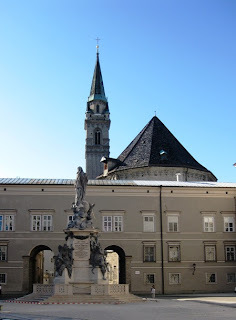 Salzburg was such a treat. It was absolutely the perfect ending for our trip to Europe. That was YOU in the picture?? I thought it was Julie Andrews?? The similarity is striking--just wish I could have heard the sound byte!! It makes me proud that you would go to all that trouble to bring Minnie a gift from Europe. You are a very good daughter. And her Mother appreciates the time and love put into those ornaments BUT is EXTREMELY jealous that SHE was not the one standing where Maria stood and singing where Maria sang! !